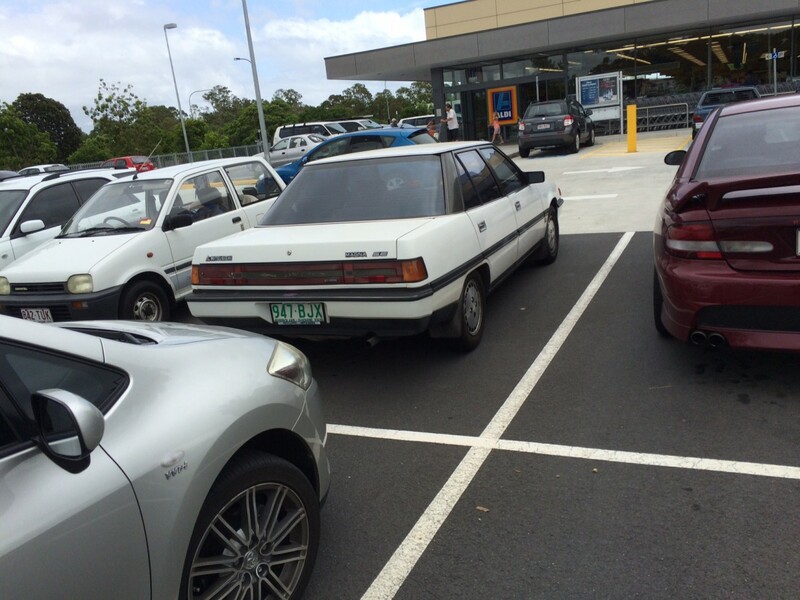 The Opel Omega wasn’t the only car to be sliced down the middle and widened for Australian consumption. 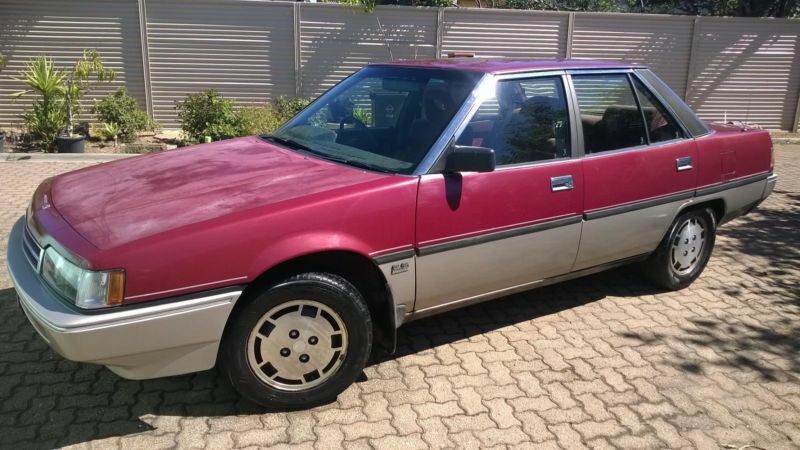 Three years prior, Mitsubishi introduced the Magna, a car that helped cement its position in Australia as one of the most powerful Japanese players, despite getting off to a rough start. The Magna was the first serious attempt by the Japanese to tackle the family sedan market with something modern yet suitable for Aussies. Its predecessor, the Sigma, resembled the other family sedans other Japanese companies were peddling in Australia in the 1980s: stodgy and rear-wheel-drive. Mazda’s front-wheel-drive, space-efficient 626 was a breath of fresh air, but Toyota and Nissan trudged along with the antiquated, locally-assembled Corona and Bluebird well after they were replaced in overseas markets. The Sigma was flagging and Mitsubishi’s Australian fortunes were rapidly fading, so the Magna represented a real Hail Mary pass. Introduced for 1985, the Magna was based on the overseas Galant but was widened by 2.6 inches – enough to make it a comfortable five-seater – and underwent modifications to make it more durable for our tough climate and tougher roads, including heavier axles and a stronger transmission. Originally, Mitsubishi had intended to simply rebody the rear-wheel-drive Sigma, but realized this was a developmental deadend. Mitsubishi’s efforts in so thoroughly Australianizing its Galant were rewarded with the Wheels Car of the Year trophy for 1985. TM SE. Photo courtesy of OSX. There was just one engine choice, as Mitsubishi eschewed the turbos and V6s available overseas. Instead, Mitsubishi’s venerable 2.6 Astron four – dating back to 1978 – provided motivation in either carburetted (114hp, 146 ft-lbs) or, from 1987, fuel-injected versions (124hp, 151 ft-lbs). The latter was considerably smoother in its power delivery, and both versions featured balancing shafts to help curb the excessive vibration inherent in larger four-cylinders. This was the same 2.6 employed in myriad Chrysler products, including the K-Cars. Underneath, the Magna was much like other contemporary front-wheel-drive sedans: four wheel disc brakes, MacPherson struts with L-shaped lower arms, coil springs and anti-roll bar suspension up front, torsion beam rear axle with anti-roll bar, trailing arms and coil springs out back, and rack and pinion steering with optional power assistance. Transmissions were a five-speed manual or four-speed automatic with electronic overdrive. It was the automatic transmission which left a bad taste in many mouths, as early TM Magnas had particularly unreliable units. A fast-wearing transmission housing would lead to failure and an expensive repair bill. In addition, there were complaints of leaking head gaskets, rattling timing chains and smokiness. TP wagon. Photo courtesy of OSX. Owing to their front-wheel-drive packaging and increased width, these Magnas were spacious cars and boasted more cabin room than a contemporary Commodore, as well as rival Japanese mid-sizers. However, their Astron engines, despite being grunty for a four, were two cylinders short of the Falcon and Commodore. Thus, the Magna occupied a curious in-between spot in the market. Still, the first Magna had plenty of appeal. The flagship trim level was the Elite, which featured velour upholstery, steering wheel audio controls, digital instruments, power windows, central locking and a stereo with graphic equalizer. An Australian designed wagon would arrive in 1987, and 1989 would see the arrival of the much improved (but curiously named) TP series with an improved automatic. A sporty Elante sedan and Grand Tourer wagon would join the lineup, as well as numerous special editions. Only the TP series cars seem to be on the roads today, with TM/TN cars seemingly extinct; the featured car is a TP. A new, more modern Falcon and Commodore would arrive for 1988, and the Magna would start to look a little old-fashioned. The Magna would soldier on until 1991 when an even bigger Magna would arrive with optional V6 power; an Australian-developed wagon would follow, and be exported globally. The Magna wouldn’t ever inspire the fervor the Falcon and Commodore would, but it would enjoy a loyal following over its twenty year run. I know its a bit perverse, but I really rate the styling of the 1987-91 wagon. Take away some of the crappy detailing and I think its a genuinely great shape. Generic Mitsubishi actually but Australia has such a restricted range of cars available it isnt noticed. Another great article that helps de-mystify the Australian market for those of us on the other side of the world! We had the non-widened version of this car as the Sigma, and I think it was one of the more attractive sedans of the 80’s. It didn’t sell all that well though, at least on the East Coast. Didn’t have the turbo version either but there was a V6, which became standard at some point as they tried to pitch the car farther upmarket than the Accord/Camry/etc by making a whole raft of gizmos and a V6 standard. Pretty rare today but I’ve always liked them. Is that white Magna what turned into the Diamante for the US market, I wonder? Certainly looks similar. In Japan, the Galant Sigma was always intended to be a more upscale luxury car; that vintage Sigma/Eterna was in about the same price class as the Nissan Laurel or Toyota Mark II/Chaser. (Mitsubishi also had a bigger luxury car, the Debonair, which was nominally supposed to be a Toyota Crown/Nissan Cedric/Gloria rival, although I don’t think its credibility was very high and it wasn’t exported much if at all.) Interestingly, the first Diamante was still badged as the Sigma in some European markets, although it was “Diamante” in Japan as well as the States. Correct, the white Magna above was indeed the basis of the Diamante wagon (US & Japan), which was sourced from Australia. But it was the up-scale Verada model. As for the V6 you refer to, I am not sure where you live, but NZ had it as the V3000. 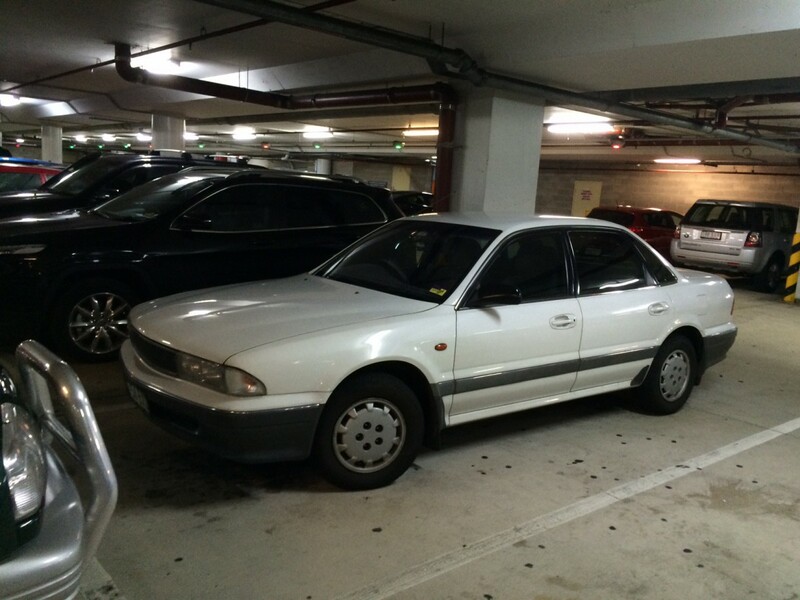 Wikipedia has a very detailed article on all variants, if you look for MITSUBISHI MAGNA. Sweet looking car. Its body resembles the Mitsubishi Galant here in North America. Whether it was ever available as a station wagon, I can’t remember. I’ve only ever seen 1 of these in the U.S. It sat on a tatty used car lot in “the wrong part of town” when I lived in Memphis. It’s unfortunate but Mitsubishi has always had “second tier” status among Japanese sedans here and this car could have turned that around with some publicity. BTW, I seem to remember these as having velour upholstery here. We would get Mitsubishi wagons in 2 sizes in the states….but NOT at the same time. The 1st wagon to appear was the Mirage (or Lancer?). Available with FWD or even AWD. These were Japanese-sourced cars. Then after these cars vacated the showrooms, we got the bigger Australian-sourced Diamonte wagons….ALWAYS with V6 and automatic. Being a fan of Australian movies, my dream at one time was to own an example of every Australian built car available for sale in the U.S. Yet, I really wanted an Australian Ford most of all a Falcon or Fairmont. At the time, Mitsubishi actually produced the best looking cars and trucks. I would much prefer a Mitsubishi Mirage of the 80s and 90s than what’s being offered today. Fascinating. And one wonders if this wider version might have had some appeal in the US. Maybe not, as competing against the full-size sedans offered here would probably have been an exercise in futility. That made this U.S. citizen almost choke on his coffee. I guess that Mitsubishi had to be a player somewhere, because they just never have had much traction here. They are so off the radar right now, I had to look for a U.S. Mitsubishi Cars sales website just to confirm they are still in our market. It appears they offer one sedan, a couple of light crossovers, and two people pods in gas and electric flavors. Howard’s comment that Mitsubishi is a second tired Japanese company here might be generous. Toyota, Honda and Nissan are the top tier, Mazda and Subaru are a solid second, and Mitsubishi and anybody else fall to the third tier, kind of where Suzuki and Isuzu used to swim among the bottom feeders. Mitsubishi’s two bright spots in the U.S. were as a captive import at Chrysler, which the company acknowledges on its website, and the closest thing to a popular vehicle under their own name was the Montero SUV, which I haven’t seen on the road in a very long time. The Montero also gets historical mention on their website. I guess you have to hang your hat where you can. Cool article, and a reminder that I did actually like the looks of some of their larger sedans and wagons – I had completely forgotten these cars until seeing this article today. Well, MMAL seemed to be doing pretty well in the 90s with the Magna and Verada sedans. But it’s rather odd that they really went into a rapid decline in the 2000s and shut down their manufacturing operations in 2008. Mitsubishi Motors, is, however, still pretty strong in Southeast Asia, namely Thailand, Philippines and Indonesia – I think they export the Mirage or Lancer from Thailand. Historically, I was always struck that in the U.S. Mitsubishi seemed to compete across a broad range of vehicles (as if they wanted to match up model for model with the bigger Japanese manufacturers), but was truly competitive in very few market segments. What Mitsubishi models could ever really be described as “popular” in the U.S.? The Eclipse? Maybe the Montero? How strange that Australia got a widened version and the US didn’t… seems like it would’ve been a smart move for our market and a nice way to stand out from the Camry and Accord (which were still quite petite). In Mitsubishi’s case, not bringing it to the U.S. may have been a combination of capacity issues and Mitsubishi’s agreement with Chrysler — the Magna would have been more of a direct competitor for Chrysler’s bread-and-butter cars than the Colt or Galant. The Australian organization may not have had the spare plant capacity to provide more cars for export (which might not have been economically practical anyway) and building something like the Eterna in Japanese plants was probably a little dicey because the Eterna would not have been viable in the domestic market until the end of the run because the extra width would have landed it squarely in the, “Yeah, no thanks” tax class. I’m speculating, but it is an interesting idea. The widened Camry appeared in late 89 in NZ as a test market and was then suitably modified for world consumption making it into the world showrooms in 92 or so. The other Jap makers werent all that far behind Mitsu its just you didnt get the cars. I read recently that Mitsubishi has decided to concentrate almost exclusively on electric, hybrid, and alternate fuel vehicles. They figure they will always be a niche company and would rather be a biggish player in a smallish pond than a small player in a huge pond. As a consequence, no more EVOs, no more sporty/Eclipse-type coupes….unless they are alt fuel powered? Trucks and SUVs will continue, at least for the time being, for “emerging” markets. The idea being that Mitsubishi will be a poor man’s Tesla. Mitsubishi are still making trucks I mean real trucks not pickups, Tractor units and the like under their Fuso brand those have always been quite good, they are model sharing a SUV with Peugeot which is rumored to be quite good in either brand though the HDI diesel is only available on the Pug version and is the pick, their smaller cars are still on our market though I have no interest in those and cant tell anything about them, So they arent gone yet. And they used to build such fantastic cars in the Magna and Verada range, far superior to anything from GM, Ford, or Toyota (Nissan and Honda are only bit players in Australia). After 25 years of owning big Mitsubishis, we’re going to have to look elsewhere for our next car. Not happy, Mitsubishi-san, NOT HAPPY. These cars gave an ok ride good fuel economy reasonable handling, roofs that rusted through the pillars within 3 years biodegradable transmissions cracking engine blocks oilburning from near new, Yep they came with myriad issues but not all of them some were great in manual form I know of two that ran for years with few problems other than pillar rust and on the other oil consumption some never made it out of the warranty period. I know there are people like you who will run these cars down, but we had no trouble with any of ours. Our fours were manuals, so we didn’t have the fragile automatic to contend with; it had a bad rep when new. No sign of rust (southern Australia, not NZ, admittedly), no oil burning trouble with the Astron 2.6 until it reached 250,000km (by which time we thought it was fair enough), over 320,000km from the sixes with no problems, and the cars had an overall aura of refinement which left you feeling it was a real steal at the price – far, far superior to the opposition whether Japanese or Australian. Mitsubishi was the company Australia could not afford to lose. Memo Japan: Take your silly Toyota, and give us Aussies our Mitsubishi back. The first Magnas were also a lot quieter and more refined to drive than the Commodore and Falcon. Friends had a 5-speed one and the difference was noticeable. The Astron II engine was being built locally so that would have been a big factor in keeping it, it also made about the same power as the 3.3 Holden. The early Magnas rust pretty badly, I have seen some showing door innards ( rusting from the top down), and that is in a country that doesn’t use salt on roads. Did the Sigma drop off in sales that much? I would have thought they sold strongly in 1983-84, later on when they were selling beside the Magna was obviously different. The sedan lasted until 1986 and the wagon until the Magna took over in 1987. I miss the midsize (although they are small by today’s standards) rwd cars, and still like large 4-cyl engines. Toyota, Nissan and Mitsubishi manufactured cars in Australia while Honda did not, and as a consequence were more expensive. The Civic was always smaller than the competition which hurt it, and Honda did not sell an SUV in Australia until whichever came first of the CRV/MDX while the other 3 makes had them and pickups. The roof rust one I knew belonged to a friends daughter in Sydney a known rust area salt air is more effective that salted roads it drove ok for what it was but I preferred the Commodore I had at least it had some resale value where the Magna had none several peoplke I knew bought Magnas thinking they were getting a reasonably late model car for a bargain price only to discover the couldnt trade or sell them for any more than wrecking money and thats on the Aussie market where cars hold their value almost until they fall apart. I had a couple of Sigma wagons a 2L and 2.6L both 5speed manuals they were good reliable cars the 79 2L I circumnavigated Australia in only replacing brake pads and tyres it was a $500 rust bucket but it kept going. Is it my imagination or the b and c-pillar as well as the roofline of the Magna reminds me a bit of the Renault/Eagle Premier? In the US the Galant and Sigma sold very poorly, though ironically I was driving around this morning and I saw an 89-90 Sigma parked, albeit in roadworthy condition. It was the first one I’ve seen in about 15 years. I drove a V6 wagon of the TE+ variety. Sweet sounding V6, had to be careful with the throttle to avoid spinning the tyres at every stoplight (it was raining). Interior wasn’t too bad. I remember seeing that wagon on a hoist and the rear suspension was more like a GM FWD A-body: solid axle with 2 trailing arms and a Panhard rod. They used the same on the Galant. At that time, I heard plenty of stories of failed trannies, seems like a lot of mechanics cut their teeth with them, and also about smoky engines. The roof rust issues on these cars was on early models , There is a chrome moulding that wraps around the top edge of the roof, I have heard it was caused by being too close to the corners of the roof, at the pillars, which rubbed on the paint when the body flexed, eventually exposing the steel . later models allowed more space at the corners, completely solving the problem. I had one of these for a while , very nice riding car. Normally now driven by ‘down on their luckers’. If I was home I could post my favorite picture – a torched on the side of the road Magna. I was collecting photos of wrecked Magnas to make a coffee table book – called Magnacide, such is my hate of these horrid things. I don’t think I’ve seen a Sigma in the US since, well, forever. I think I’ve seen more HenryJ’s in the last decade. And, after today, more Trabants. Mum had a TP series wagon, with a 5 speed manual. It was a pretty good car overall, but the quality you got from Japanese built cars just wasn’t there. The paint for example was noticeably poorer. It was however very reliable, unlike the automatics. Fun fact – the 5 speed was an adaption of the dual range 4 speed found in the Colt. The overdrive found on the lower three gears was deactivated, making it a 4 speed with OD fifth. I think the Diamante was the Magna’s successor, one of the very few Aussie cars exported to US, along with the Capri. They were a bargain on the used car market, and quite handsome. I thought Mitsubishi was going to move up back then, with those, the Spyders and 3000GT. What happened? Diamantes were also built in Japan for many models the later export to US were Australian I hired one in Melbourne for a few days it was ok on the freeway but we took into the Dandenong ranges huge mistake IVe never driven anything with such little turn in ability it just understeered at every corner awful car on twisting roads it had a 3.5L 6 and had good boogie in a straight line but thats all. It made a Camry 6 seem surefooted and competent. Yes, our Veradas came with that; the cheaper Magnas did not. There’s a switch on the dash of our ’00 Verada to disable it. The Mitsubishi Galant, in the US(the 1st generation in US, also) from 1985-90… became Galant Sigma from 88(89)-90… This 1st gen bodystyle, sold alongside the 2nd gen Galant in 1989-90… The former as the Galant Sigma and the latter as the regular Galant. It seems like yesterday, when I was at the old Patriot Auto Sales in Westport, MA… to try to find a 2nd car. 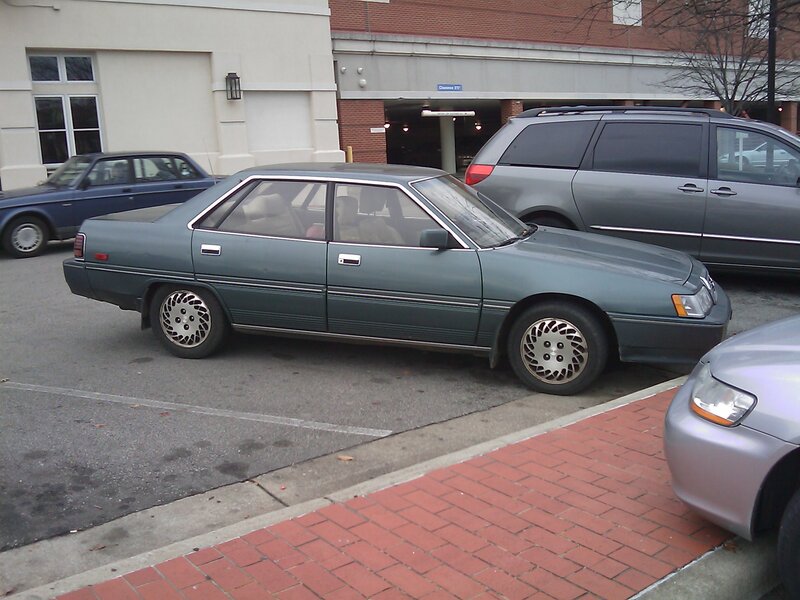 I test drove a tan 86 Galant and an 83 Cressida. The Cressida was black, had all the cheesy chrome trim(remember, the chrome tape for the rocker panels?) and had limo tint… which would’ve been a law enforcement magnet. Loved the inline 6 power, but the car had a driveline clunk. 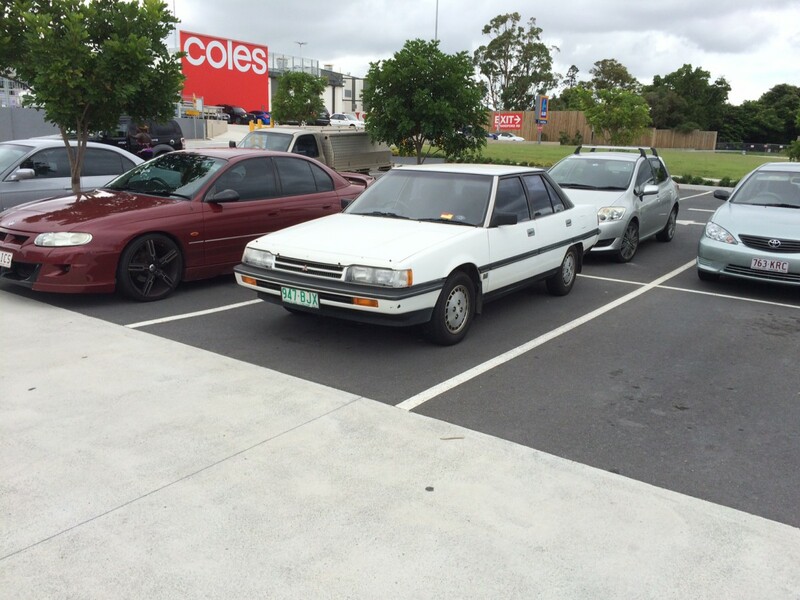 So NO, to both cars… but that Galant is a RARE sight, nowadays. Funny, how the Galant became a beluga whale, and car akin to a Camry or Taurus, in it’s later years… with NO fun to drive aspects… except, the 2nd gen VR4. The VR4 only lasted one gen in the US. 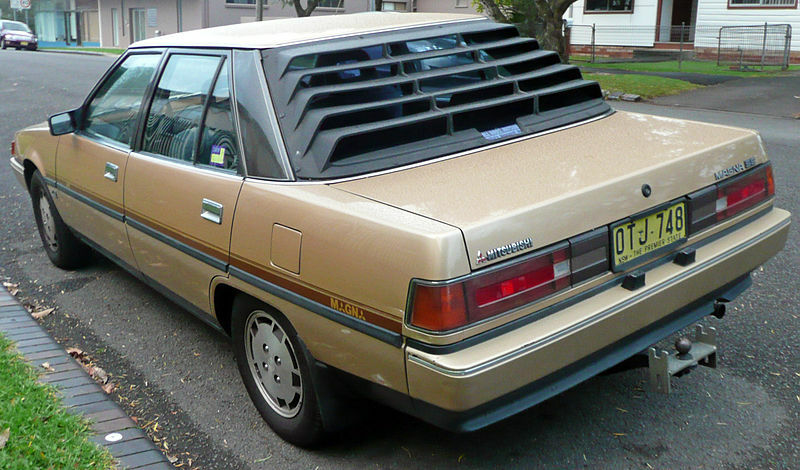 ** LOVING, those rear window louvers on that tan Magna… could you get any more 80’s than THAT? Pure kickass. Those louvres were a factory option. We specified them for ours too. They were extremely common on Aussie cars back then. I remember test driving an almost new 1986 Galant in early 1987. At that time, Mitsubishi was starting to expand into the southern states. Within a short period of time, we had a few dealerships to open in NC (Charlotte, Raleigh, Fayetteville) and some in SC (Florence, Columbia.) One day my dad and I were in Florence and while passing by the new dealership, I decided to pull in and check the offerings. I was taken by the Galant and the dealer had two – one white with tan leather and another one in tan with tan leather. The tan one I drove and I was impressed with the perceived quality, smooth driving, and technical advances. I remember the dealer was very willing to deal and I was almost set to trade in my 1986 Thunderbird Elan. In fact, the salesman thought he had the deal made when my dad asked to speak with me. He asked me to stop and think about the complexities of this car, its unknown reliability, as to us, a new make, and the limited dealer network which would involve over an hour’s travel time from our home to any one of the dealerships. Keeping this in mind, we left quickly. Through the years, I have always been on the lookout for one of these. I can count on one hand, the actual ones from these years I have seen on the roads. 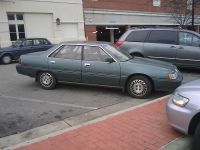 The Galant Sigma seemed to be more popular in our area and I remember quite a few on display at the Mitsubishi dealership that later opened in Monroe, NC. In fact, within the last year, I have seen a Sigma plying the roads in a neighboring town. I constantly check Ebay, Craigslist, backyards, and those ratty car dealerships whenever I travel. I think it safe to say, my search is pointless. However, I keep holding onto the thought that one day, I’ll come across a low mileage example that was loved, cherished, and kept by its original owner – waiting just for me! Love some of your other mentions too. A Fuego or a Cordia would be particular “holy grail” finds! Bill, I love your comment. I think a lot of us car enthusiasts who loved the rare, unique and overlooked model of cars when we were younger, still love those cars when we see a pic or rare photo on the Internet or, say, a used car ad. Seeing these gems reemerge after they’ve stepped, magically out of “the automotive land that time forgot”… Is like seeing or having a 2nd chance at obtaining that “unicorn” or “rare Pokemon” of a car we once thought, vanished from the streets and driveways. I’ve come a across this rare Galant twice, once on a lot in 1996, and 3-4 years ago on a used car site… Going for $1500, in GREAT original shape… At the time “another excuse”, let it slip by again. These cars rarely come up, now what’s the chance of one coming up today? I refuse to believe that, my friend. Although, most bandwagon car collectors would scoff at these overlooked orphans… I, like you, appreciated seeing them drive around and being a part of the usual landscape. Sarcasmo: It is good to hear from someone else who feels like I do. And, you pegged my thoughts and feelings exactly. 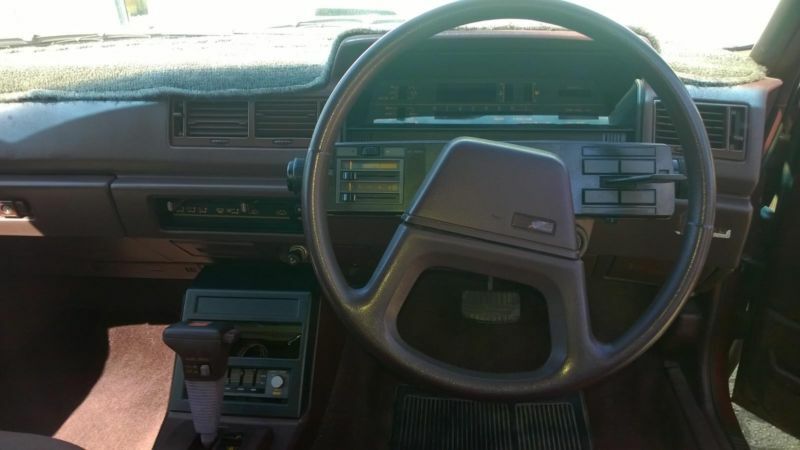 Furthermore, many of the cars you listed I share a particular fondness for as well – especially the Subaru XT6, the Fuego, and the Maxima – especially from the ’85-’88 years with the neat “jump up” memory tilt steering wheel. Other cars I’ll add to the mix are the 1995-1999 Buick Riviera (missed a nice one this summer by a day) and the 1976-1977 Buick Regal Landau which was my first car as I received one for my birthday present when I turned 16 in September 1977. Kiwibryce what rubbish you speak. 3rd Gen 3.5 V6 Magna was a beautifull handling car, much better than either wayward ’60’s tech Falcon and Commodores of that era. I had a 3.5 Verada and a 3.8 VR Commodore S manual. The Verada was miles ahead in drive ability and handling compared to the Commodore. Also the Verada was way more durable than the crappy Commodore, Commodore was always at the machanics getting something repaired, like the power steering pump catching fire while parking in a suburban car park. Commodore sent to wreckers in 2004 while Verada lasted to 250,00ks and traded in 5 years later. Has anyone noticed how similar the Magna looks in profile to the Leyland P76? I wonder if you can fit a 44 gallon drum in the boot?